In this post, I think I should explain why it is that I write a lot of my thoughts down in poems. I never really thought I would ever do that, its just something that kind of happened. But, to me, poetry has an ability to enhance the visualization of the words on the page, or a way to better describe what it is I am trying to say. It elevates the sentiment. Im not saying that I am the next Edgar Allen Poe, or anyone special, but I do enjoy thinking, and visualizing these thoughts into verses that do those thoughts more justice than they would otherwise receive. Poetic words, in a way, almost paint a picture in my mind. I think that poetry or lyrics compromise at least half of the power of music. Take away the sounds of good music, and with just words, the power remains. “In one of those tedious nights we had lain as if in sleep till the hour of midnight had passed, and our ears and hearts bad been pained, while we had listened for hours to the obscene jests, the horrid oaths, the dreadful blasphemies and filthy language of our guards, Colonel Price at their head, as they recounted to each other their deeds of rapine, murder, robbery, etc., which they had committed among the “Mormons” while at Far West and vicinity. They even boasted of defiling by force wives, daughters and virgins, and of shooting or dashing out the brains of men, women and children. SILENCE, ye fiends of the infernal pit. In the name of Jesus Christ I rebuke you, and command you to be still; I will not live another minute and hear such language. Cease such talk, or you or I die THIS INSTANT! He ceased to speak. He stood erect in terrible majesty. Chained, and without a weapon; calm, unruffled and dignified as an angel, he looked upon the quailing guards, whose weapons were lowered or dropped to the ground; whose knees smote together, and who, shrinking into a corner, or crouching at his feet, begged his pardon, and remained quiet till a change of guards. I have seen the ministers of justice, clothed in magisterial robes, and criminals arraigned before them, while life was suspended on a breath, in the Courts of England; I have witnessed a Congress in solemn session to give laws to nations; I have tried to conceive of kings, of royal courts, of thrones and crowns; and of emperors assembled to decide the fate of kingdoms; but dignity and majesty have I seen but once, as it stood in chains, at midnight, in a dungeon in an obscure village of Missouri. I love the picture in my head that comes as Parley describes the dignity of Joseph Smith. Words can be so much more than just words. They can move us to feelings of loyalty, honor, indignation, courage, love, or reverence. Even better when those words describe something amazing. To me, one of the most important events in the history of the world is the story of Joseph Smith and the first vision. It contains an immense inherent power that I feel each and every time I hear it, present it, think about it, or hear songs about it. It happened. There is no question. So, I have written a few words to try and express my testimony of this event and of this man. I want my testimony to be public, on the record, etched in stone, so that there is no doubt as to where I stand. I want my kids to be able to look back at these words when I am gone, and draw strength from them. 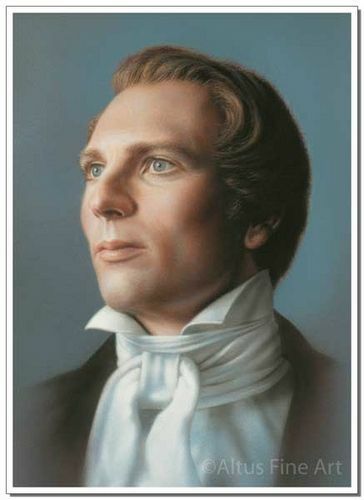 I look forward to the day that I can stand shoulder to shoulder with Joseph Smith, embrace him, and thank him for his immense personal sacrifice so that I, with my family, could enjoy the fullness of the blessings of God. I love him. I honor him, and I will praise him forever. God bless Brother Joseph. To see God’s purity and truth through apostatic cloud. 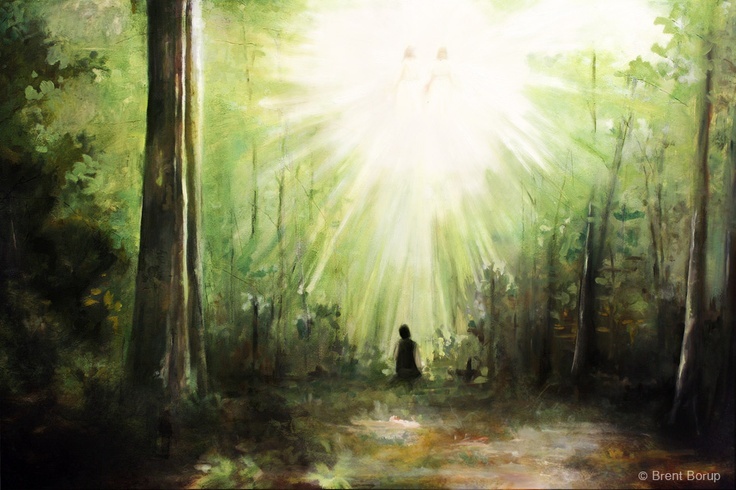 The snake had hissed his blinding mist that shaded God’s pure light. Inspired by whisp’ring spirit voice, a boy, obscure, was meant to stand. The hosts of angels in the clouds of Heav’n knew the plan. For God himself would bring the truth- restore to lightless land! For bitterness and strife there dwelt, not fertile gospel sod. So on his knees, petition sent, in sacred grove of trees. It overcame that humble boy now filled with deep despair. Almost succumbed to evil’s grip, and helplessness profound. A brilliant beam of Heaven’s love and light beyond compare! as every creviced inch of earth was bathed in brilliant white! Replaced with overwhelming love- midday replaced the night! All life then bowed before Creator of the Earth and skies! Descending in pure majesty- The Father at his side! The God of all the Universe! Perfected! Glorified! Restoring revelation’s pow’r, the veil cleared from men’s eyes! Had just beheld majestic glory of the Son of Man! To share! Declare! that truth returned to promised cov’nant lands! With violent rage of blinded men, now minions of the liar! As Joseph’s faith through wind and fire became his offering. That fed the flood that o’er the thirsting earth began to swell! And cry aloud for vengeance, while their testimonies stand! This light to end all darkness, meant to feed the gospel flower. This mighty man, the prophet dear, My Prophet still, he stands! And I shall know and see his face, embrace, and clasp his hands! And I shall honor and revere- SHOUT praise to that great man! Great post and great poem. “Words” are so powerful. For in the beginning was the Word, even the Son, who is made flesh, and sent unto us by the will of the Father (JST John 1:16). It is interesting to note that this great man (Joseph Smith) was the very instrument which God used to bring forth so many of “the words” that we have available to us today.